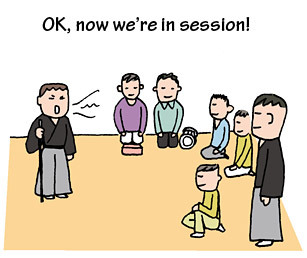 TRIVIA of Noh : Q37 : How many times do performers rehearse a piece? | Home | Trivia | Q37 : How many times do performers rehearse a piece? How many times do performers rehearse a piece? Though a leading actor plays a big and important part in a Noh play, it should not be considered a solo performance. Plays will be completed only when all other performers, including reciters, musicians, supporting actors, and Kyōgen actors, collaborate with the leading actor. When you see the same piece performed by different schools, you will find different ways of chanting or dancing, as well as different stage effects. Therefore the musicians will have to adapt themselves to every single performance. It is rare for performers to gather together to rehearse a piece multiple times before it is performed. They have a run-through rehearsal, called mōshiawase, to review the dramatic arrangement, but it is normally held only once. Moreover, because masks and costumes are valuable and provided exclusively for actual performances, actors use different masks and costumes for rehearsals. It is also the case that arrangements are completed in short conversations. Every stage performance occurs only once. It is a singular event never to recur in the lifetime of the people in the theatre, including the audience.